Sprouting is something I’ve only recently gotten into. But it’s heaps of fun. A brilliant way to have access to super ‘fresh’ food if you don’t happen to have space for a veggie garden. I can imagine it would be a really fun project to do with kids. And the best thing is home made sprouts taste wonderfully fresh and sweet with none of the ‘dirty’ flavours you often find in commercially produced spouts. Day 1. Rinse legumes and place in a bowl. Cover generously with clean cold water and stand for anywhere from 8-36 hours. Day 2 AM. Drain sprouts. Place a clean tea towel inside a strainer or colander. Add sprouts and place on top of a bowl to collect any water that drains out. Cover with one end of the cloth and leave somewhere out of direct sunlight. Day 2 PM. Rinse sprouts under cold running water. Place back on top of the bowl and recover. Day 3 AM. You should have some legumes sprouting. If so they can be eaten now or refrigerated. Or if you want more sprouting action continue to rinse and stand every morning and evening until you’re happy. lentil sprouts – pretty much any lentil can be sprouted. chickpea sprouts – I can’t believe I haven’t tried these yet! Make sure you soak for long enough to fully rehydrate the chickpeas. alfalfa sprouts – same principle. Just need some alfalfa seeds to start. bean sprouts – pretty much all dried beans can be sprouted, but I’d avoid red kidney beans because they can be toxic unless cooked sufficiently. split pea sprouts – both green and yellow should sprout fine. salad – like this sprout & roast pumpkin salad. – NEW! canned legume substitute – a wonderful fresh alternative to canned beans, lentils and chickpeas. Can be used in warm and cold dishes. soup – toss a few handfuls into your favourite veggie soup for a protein boost. nut-substitute – add for extra crunch and protein anywhere you’d normally add nuts. stir fry – use as a protein source in your favourite stir fry. No other option! Takes about 3-4 days. Even though they take a bit of work, resist the temptation to make more than you would use over a few days because they’re much nicer when freshly sprouted. Keep in an airtight container in the fridge. Best when fresh but will last for about 5 days. Texture will go watery if frozen. 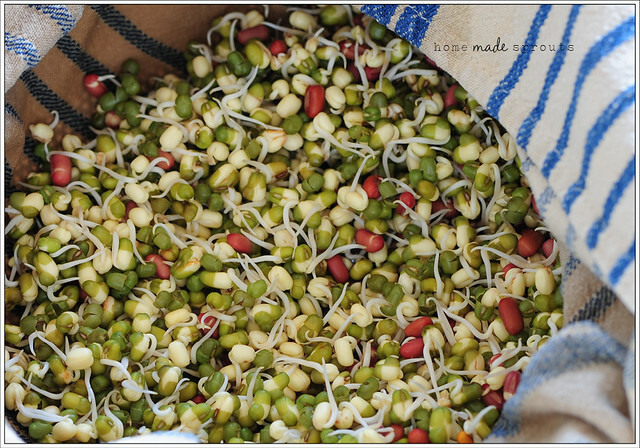 no sprouting action – it’s more than likely that your legumes were too old. I’ve had a problem with old green split peas that were in the pantry for longer than I could remember. Buy some new legumes from a busy shop and try again. Also remember that different legumes will sprout at different rates, so it may just be you’ve chosen slower legumes. Another cause could be that the legumes weren’t hydrated enough during the initial soaking. If you suspect this is the case, soak for another 8 hours or so and see if that makes a difference. legumes ‘smelly’ – sounds like you haven’t been rinsing often enough. Try giving a good rinse and then rinse every few hours for a while. It could also be that the legumes aren’t draining properly. If they’re too wet they will start to rot. If this happens, time to start again from scratch. Another cause is if the temperature is too hot. If you’re trying to spout in a very warm climate or it’s the middle of summer, try and find a cool place for sprouting. The fridge will be too cold. legumes going mouldy – I haven’t come across this but throw them out an start again with fresh new legumes. Mold indicates things are too warm and /or too moist so make sure the legumes are well drained between rinses. Back to: The Weekend Cook Overview.